SINGAPORE - A tree on the grounds of the National Museum of Singapore was damaged after a thunderstorm hit early Sunday (May 22) morning. 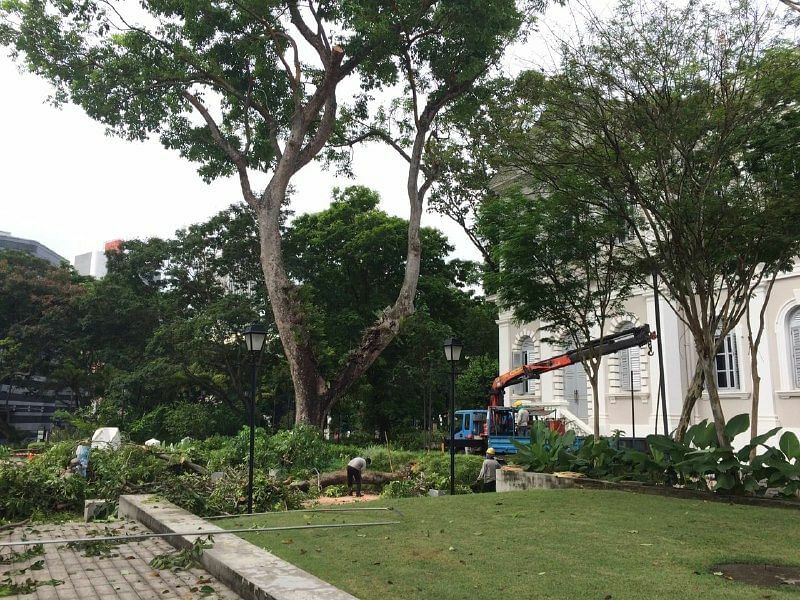 Two big branches from the tree, located behind the museum's iconic banyan tree, had fallen to the ground, the museum's senior assistant director Jervais Choo said in response to queries from The Straits Times. "Fortunately, no one was hurt and no property was damaged. The area has been barricaded from public entry," he added. When The Straits Times visited on Sunday morning, contractors engaged by the museum were busy working to saw off damaged branches and clear the ground of debris. Many an art installation have been set up near both trees over the years, and the area also previously hosted the popular Under The Banyan Tree, an outdoor film screening event that sought to relive the atmosphere of drive-in cinemas of the past. The National Environment Agency (NEA) had issued a heavy rain alert at around 12.48am on Sunday, warning that moderate to heavy thundery showers with gusty winds were expected over many areas of Singapore. Heavy rain warning: Moderate to heavy thundery showers with gusty wind are expected over many areas of Singapo.. . It said last week that the rest of May will likely be marked by showers on most days.